← Until the Dawn Comes by Sr. Joseph Andrew O.P. Benedict XVI gave a first motivation when he announced the indiction: “The mission of the Church, like that of Christ, is essentially to speak of God, to remember his sovereignty, to remind all, especially Christians who have lost their own identity, of the right of God to what belongs to him, that is, our life. Precisely in order to give a fresh impetus to the mission of the whole Church to lead human beings out of the wilderness in which they often find themselves to the place of life, friendship with Christ that gives us life in fullness”. This is the main purpose, so as not to forget what characterizes our life: belief. To exit from the desert, bringing the silence of those who have not to say we receive the joy of faith thus speaking about it in a renewed way. This year therefore is aimed primarily at the whole Church so that in the face of the dramatic crisis of faith which touches many Christians, she will be able to show once again and with renewed enthusiasm the true face of Christ which calls her sequela. It is a year for all of us because through the perpetual journey of faith we feel the need to reinvigorate our steps, which become at times tired and slow, and to give the most assertive witness. Those who understand their weakness that often take the shape of indifference and of agnosticism in order to find the lost meaning and to understand the value of belonging to a community, true antidote of the bareness of the individualism of our time cannot be excluded. 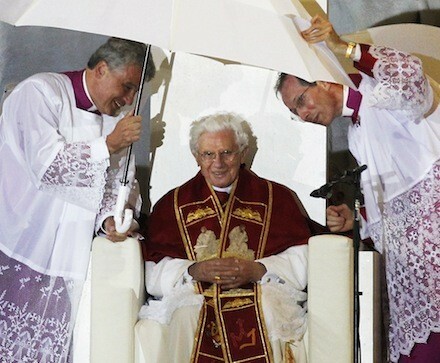 In “Porta Fidei”, however Benedict XVI write that this “door of faith is always open”. This means that no one can feel excluded from wondering about the meaning of life and about important questions that strike us due to the persistence of a complex crisis which increases the questioning and which eclipses hope. Asking the question of faith does not mean withdrawing oneself from the world, rather it means being conscious of the responsibility that one has in regards to humanity at this historical juncture.